Originally it was to keep my weight down, now it is to keep be even keeled. 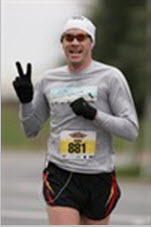 Runnign reduces my stress and allows me to relax and enjoy life. Without running, I would be stressed, high strung, and an angry person. Too many to count. My first marathon win (very unexpected). Crossing the finish line at Boston. Sunrises during marathons. (as an unofficial pacer) I once met a guy 1 mile into a marathon who was running his second marathon ever and trying to qualify for Boston. I ran with him for the next 25+ miles and he qualified with 30 seconds to spare. Running in between a mother and baby moose (in Alaska). World record fastest marathon while dribbling a basketball. You can meet your goals and have fun all at the same time. I give of my time whenever possible, at local races, the Boy scouts, school activities, etc.